Magic Johnson was selected first overall in the 1979 NBA Draft by the Lakers. He won a championship and an NBA Finals Most Valuable Player Award in his rookie season, and won four more championships with the Lakers during the 1980s. 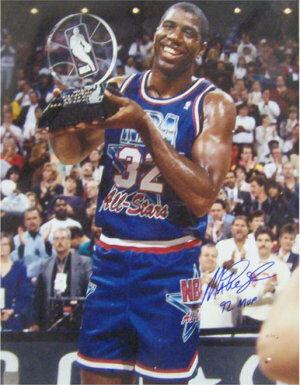 Johnson retired abruptly in 1991 after announcing that he had HIV, but returned to play in the 1992 All-Star Game, winning the All-Star MVP Award. Magic has hand autographed this 1992 All Star 16x20 Photo with 92 MVP inscription. Limited Edition of 132! Super Star Greetings Hologram and Certificate of Authenticity from Athlon Sports.